We have had five events this March. On Wednesday 1st March I gave a talk to various years in the lovely library at St Helena’s School, Colchester as part of World Book Week. 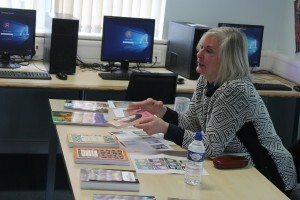 The girls and boys were very attentive and it was great to find so many young people interested in creative writing and in getting themselves published. Thanks to Luigi Callegari, the school librarian for organising the event. Then on Tuesday 14th March author, Elisa Marcella Webb and I, along with Ken Wilson-Max, attended the London Book Fair at Olympia where we had a shelf in the Poetry Pavilion, hosted by Inpress, who are handling our sales and marketing. At the fair I arranged for Ingram to handle export printing for our paperback editions and I joined the Independent Publishers Guild (IPG). The very next day – Wednesday 15th March – we held our Essex Book Festival event at the Wivenhoe Bookshop. Penny Simpson, Kathy Stevens, Petra McQueen, Anna Vaught and Emma Kittle-Pey read from the Refugees and Peacekeepers anthology and Anna Johnson, the editor made the introduction. It was a very lovely evening and it was great to see so many people there. Thanks to Sue Finn at the bookshop. 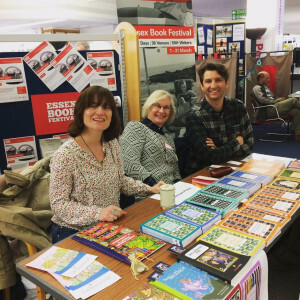 Then on Saturday 19th March we were at Chelmsford Library for another Essex Book Festival event. Here are Emma Kittle-Pey, Mark Brayley and me at our table in the ‘Larder’. 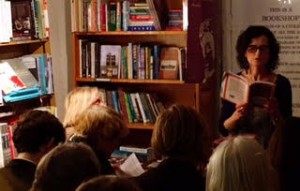 Our final event on Saturday 25th March was held in London at the Italian Bookshop in Gloucester Road. It was a very interesting and fun evening where we launched the English edition of Letters to the Cultural Rehabilitation of the Unemployed by Andrea Inglese. The book was translated by Sara Elena Rossetti and they conducted a question and answer session. Most of the audience (around 30) were asked to read his poems – in an overlapping order – in English and Italian and Andrea (who lives in Paris) read one in French – so the room was filled with a ‘patchwork’ of his multilingual words. 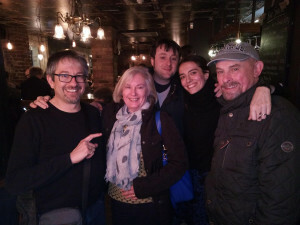 Thanks to Ornella Tarantolo of the Italian Bookshop for her hospitality and to Andrea del Cornó for his introduction and for organising the event. Here we are at the pub nearby after the event. Andrea Inglese is on the far left and Sara is second from right. Next stop: the Bologna Book Fair on 3rd April!